TEXAS (USA) Raena is from the Dallas, area. She enjoys a full schedule of entertaining in local venues, teaching classes, as well as performing with her student performance troupe and the collaborative pro troupe, Na’Di el Raks. Last year was Raena’s first year to compete and it went very well. Those experiences continue to motivate her on the more challenging days! 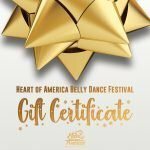 She is excited to return to the Heart of America Bellydance event for the quality workshops and the opportunity to connect with like-minded dancers from all over.